We may only be one week into the FIFA World Cup in South Africa, but if I had to start handing out awards, I’d have to give The Most Entertaining Team to Argentina, the Golden Ball (Tournament MVP) to Uruguay’s Diego Forlan, and The Most Annoying Fan to this guy in the image above. Perhaps it is too early to start giving out the first two awards, but I think I’ve seen all I need to see for the third. 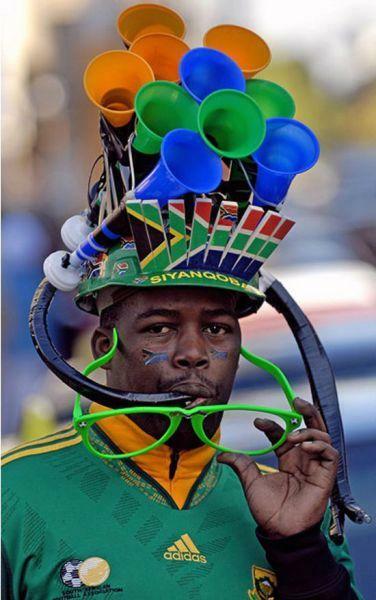 After all, if you are one of the many who has become increasingly annoyed by the constant buzzing of the vuvuzelas, how can seeing this man and his stupid hat not piss you off? Dumbest hat ever? It’s a tough call, but I’d say so.